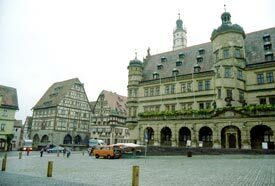 ABOVE: Rothenburg's tourist office is on the ground floor of the Rathaus, or City Hall, (the large building in this photo of the Market Square). When you arrive in Rothenburg, head directly for the city's Tourist Office beneath the arches of the Rathaus (see photo above) to pick up a free map and brochure. In addition to providing literature and answering questions, the tourist office can sell you tickets for an inexpensive city tour. Guided 90-minute walking tours take place at 2 p.m. daily from April through early November. Private Night Watchman tours are another option. You can purchase a guidebook at the tourist office, at Buchandlung Pyczak in the nearby Georgengasse, or at one of the other tourist shops around town. We recommend the English-language version of the 91-page Rothenburg ob der Tauber Guide with 144 color prints, assuming that it isn't out of print by the time you visit. The book is published by Kraichgau Verlag, costs only a few euros, is small enough to carry in a coat pocket or handbag, and includes an illustrated step-by-step walking tour of the city with excellent maps.